Does your laundry hamper bring tears to your eyes every time you get close? 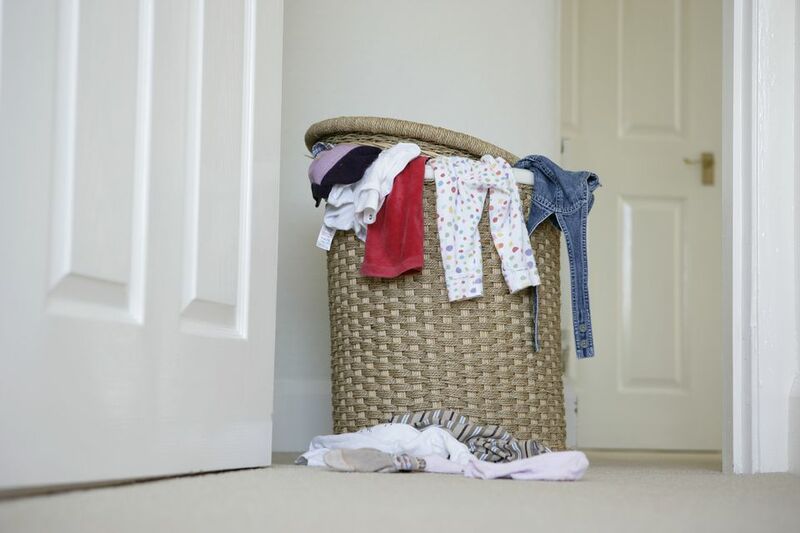 If you have stinky laundry hamper odors, the obvious way to get rid of the odor is to wash the stinky clothes. But, we all know there is more to the odor issue than just that. What the hamper is made out of is a factor in whether the hamper hangs onto odors and emptying it doesn't always take care of the problem. Here's how to get rid of the odor and prevent it from happening again. Laundry hampers, especially those with a lid, can begin to smell like dirty socks even when the hamper is empty. If the hamper is made of a material like plastic or polyester mesh that can be safely cleaned with water, use a mixture of hot water and baking soda (one cup per gallon) to scrub down the hamper with a soft bristle brush and then leave the hamper outside to air and dry. For fabric hampers, toss the fabric bag in the washer and wash in warm or hot water with a heavy duty detergent (Tide and Persil are considered heavy duty with enough enzymes to break down odor-causing bacteria and soil). Let air dry. If you have a wooden or woven hamper that shouldn’t get overly wet, use the vacuum dust brush attachment to clean the hamper inside and out. Dust can attract bacteria that leave odors. Then mix the baking soda and hot water solution and dip a white cloth in the solution. Wipe down the inside of the hamper trying to get in every crack and crevice. Next, take it outside or close to a window in a sunny spot to air. When you bring it back inside, place an open container of baking soda in the empty hamper and close the lid overnight. Whether you have a "washable" or "non-washable" hamper, if you are smelling a musty, mildew odor, then you must use a disinfectant like chlorine bleach or pine oil to kill the mold spores. For a scrubbable hamper, just add the disinfectant to your cleaning water (be sure to wear gloves to prevent hand irritation). If it is a fabric hamper, add the disinfectant to the washer during the wash cycle. Do the same with wooden and woven hampers but be aware that some color bleaching and damage to the hamper material may occur especially if chlorine bleach is used. Try not to saturate the wood or fibers. Place in the sun to dry as quickly as possible. If you have a hamper that is impossible to wash or scrub, use a disinfecting spray that can reach cracks and crevices where mold can hide and grow. It is very important to completely kill any mold spores because that mold will continue to grow and can stain and destroy your clothes. Another situation that demands disinfecting steps for a laundry hamper is if someone in your home has a bacterial or fungal infection or virus such as flu, pneumonia, or even athlete's foot. The possibility of infection is low but it is there. Again, doing the laundry frequently will lessen odors in the hamper. Never place damp clothes and towels in the hamper. Allow everything to air dry completely before tossing into the hamper. Add some baking soda to a small potpourri bag or a plastic container with holes punched in the lid to the bottom of the hamper. This will act as an odor absorber. Replace the baking soda every couple of months with fresh baking soda. Purchase odor absorbers that have activated charcoal and other ingredients to place in the bottom of a hamper. Toss a scented dryer sheet in the bottom of the hamper to mask odors. Add a stick-on air freshener to the inside of the lid. Choose a laundry hamper that is easily cleaned. Many have canvas bags or liners that can be tossed in the washer each week. Consider having several smaller hampers that don't allow clothes to accumulate in such large quantities. A sorting hamper with the smaller bins will actually make laundry day more simple.